2008 was a great year for our family. It was the year in which I became a U.S. citizen, Iggy got his "Green Card", Olivia turned ONE, I got pregnant again and many more wonderful things. In order to say a proper good bye to a wonderful year, we decided to drive up to Orlando to celebrate as a family. We drove up after work and arrived there at around 9pm. We checked into our hotel and then went to have dinner at Macaroni Grill. After that we went to Downtown Disney and waited for midnight to say "Happy New Year!". Olivia had a blast and so did we. We enjoyed seeing all the people cheering on the new year and celebrating together. It was such a fun night! Now, we want to wish you all a HAPPY NEW YEAR! May 2009 be a great year for all of us and may God always be by our side! We are happy to begin this new year with great expectations and wonderful plans as a family! Thank you God for a wonderful 2008 and thank you for letting us see another new year! My favorite holiday of the year is here! Oh Christmas night!!! This year is extra especial for us; not only because Olivia can grasp the concept of Christmas a little better, but also because we're expecting our second bundle of joy. I'm barely showing at 10 weeks, so I was still able to dress up for the occasion. It was a great celebration. On Christmas Eve, we had dinner at my parents' house; we had some yummy Hallacas (Venezuelan Christmas food) and had a wonderful time with our gift exchange. Olivia got many presents, including toys, clothes and more fun stuff. She had a blast opening presents with her cousin Erika and making a mess with all the wrapping paper. I think she was more into the wrapping paper than she was into the toys.... too cute! On Christmas day, we stayed home watching TV and assembling some of Olivia's toys... it was a lazy day. Merry Christmas everyone! Today I celebrated my 27th birthday along with my family and a few friends. It all started yesterday with a little BBQ we had in our home; we ate lots of meat and yummy desserts. I got tons of cool gifts including a bag for my digital camera, maternity clothes, cash and a few other things... it was very fun. Tonight Iggy took me out to Mazza, one of my favorite restaurants. I was able to eat lots of my favorite foods and had a very nice time. The whole day was great; I got tons of phone calls and birthday messages and was happy that so many people thought of me today. Thank you God for granting me another year!!! Happy Birthday to me! Today Olivia got her hair cut for the 2nd time. 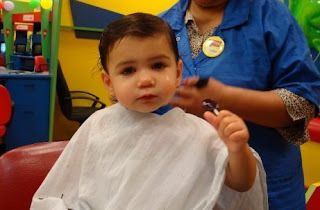 I took her to Cartoon Cuts at the mall since her hair was so messy and long. As soon as I put her down in the chair she started to cry; she was not too happy about some lady touching her hair. I gave her a lollipop and she calmed down a bit, still looking at the lady like she was petrified of her... I couldn't stop laughing. After a while, she started getting used to the idea of a new hair do. Once the lady was done with the haircut, she started cleaning her off and Olivia immediately took the powder brush from her hand. 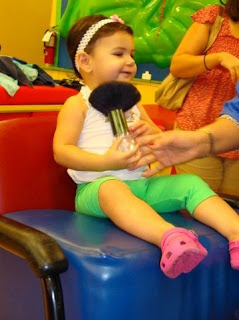 She was so excited to be done that she even started to clean herself up with the brush....it was really cute! Overall I was so happy with the way the haircut turned out. Olivia looks so beautiful!! 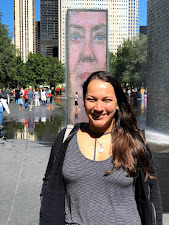 We were happy to have Danay and Eduardo visit us for a few days. They made a stop in Pembroke Pines to see us before they went to Paris to celebrate Christmas. Olivia was happy to spend some time with her grandma and her godfather; she went out with them to shop and drive around. We were also able to go out to eat a couple of times and just spend a nice time together. Although the visit was very short, we were very thankful that they came here to spend a few days with us. Thanks for visiting us! We hope you come back very soon! We celebrated my father's 57th birthday. My dad was very happy all throughout the day and we were happy to see him that way. We went to eat lunch at "La Carreta", which a Cuban restaurant that my dad likes. It was nice to get together and talk over a nice meal. My dad got very nice presents, including some of his favorite Polo shirts and some books. We sang happy birthday and my dad ate a yummy creme brulee. It was a great meal! Happy Birthday Dad! Today we finally met baby Daniela, who was born on October 29th. Daniela is the daughter of our good friends Enzo and Connie; she is so sweet and beautiful. We spent a couple of hours at the Zarrillo home, ordered some pizzas and just watched the beautiful baby. It was great holding Daniela for a while and seeing how Olivia reacted to a newborn. At first she wasn't all that happy, but later she understood that baby Daniela was another little person. We had a great time and Daniela is just precious! Today we celebrated my sister Claudia's 25th birthday with a family lunch at the Olive Garden. My sister was very happy with all of her gifts and phone calls from family and close friends. We all met around 1pm and had a wonderful time together. My sister got wonderful gifts such as a digital camera. All the servers sang "Happy Birthday" for her and gave her a yummy chocolate cake! It was a great time. Happy Birthday Sis!... many more to come! This weekend we went to Virginia to visit my good friend Kim and her family. We flew to Norfolk, VA near where Kim lives. 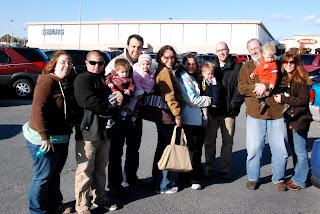 Kim and Caden picked us up at the airport on the 4th and we went home, where we met Kim's husband Brian. On Friday we went to the Virginia Children's Museum where the kids played for a while. We then went to dinner with Megan and her family as well. On Saturday we all went to the Virginia Aquarium where we met Donna, Kurt and Grayson. What a wonderful time the kids had. That night we had dinner at California Pizza Kitchen; it was great. 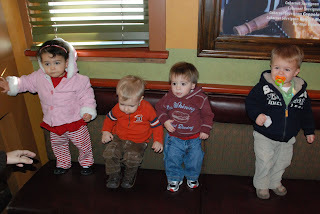 Finally on Sunday we went to have lunch at Macaroni Grill and then we took the kids to the Jumping Monkey, a place where the kids could play and have fun. It was a wonderful trip and I'm so glad I was able to get together with the wonderful ladies from the WTE board. I hope we could do it again soon! Since Iggy was so busy with work, my mom came with me to the appointment and was able to hear the good news. I was lucky enough to get my first ultrasound today and was able to see the little "flicker"... what a great feeling! The doctor said the heartbeat is looking strong and everything looks great! My due date was confirmed so for now it remains 07/23/09. I'll have my next appointment in January; by then I'll be almost done with the first trimester. I'm so excited today and so thankful to God that things are going so well with the baby!